Edit of the hair color gradient file. Hopefully this will make the colors more natural. You decide. Mindy Looksmenu Preset Looksmenu Version. SL Looksmenu Preset Looksmenu Version. 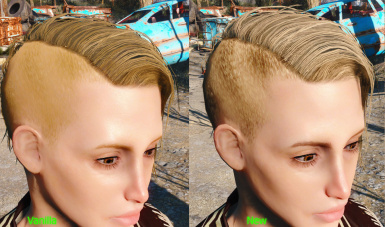 If you want to tweak my gradient file to work with some of those dye mods, be my guest. My only request is that you credit me for my work. That little gradient file you see in the .rar took me hours of trial and error to get right. GothikaGeist for offering their hair color test palettes that made this mod possible. Added a new All Naturals version. Added less streaky edited vanilla hair textures. Made to work with the Looksmenu Customization Compendium update. Added a compatible file with Looksmenu Customizable Compendium. Now Compatible with Nuka World colors. This is the work of many hours of tweaking. 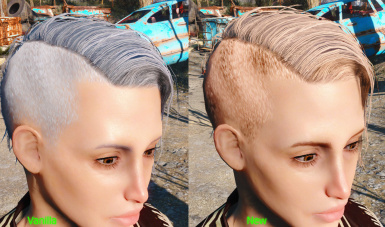 It hopefully improves the vanilla hair colors to something more like what you might find growing out of a person's head. You be the judge on whether or not you think it does the job. If enough people mention something looking off, I will try to fix it. 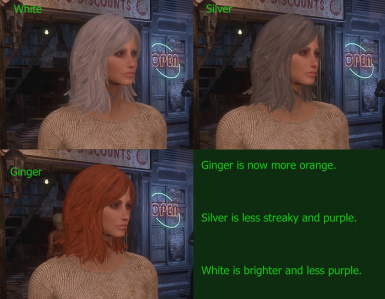 Version 1.2 improves the Ginger, Silver, and White hair colors. 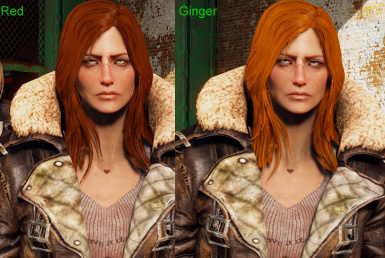 Version 1.2 Orange makes Red and Ginger even more orange. Version 1.3 grants Nuka World compatibility. Version 1.4 is compatible with Looksmenu Customization Compendium. Version 1.5 is compatible with the Looksmenu Customization Compendium update. Version 1.6 adds two new files. One file for edited hair textures, and one to replace extra colors on the color palette with more natural colors. Ever feel that blonde hair looked surprisingly like mustard? Have a hard time accepting that hairlines looked like colorful lint glued to your character's head? Me too. Here's a fix. This is not compatible with any mods that alter hair color-- unless I have provided the patch in the optional section. 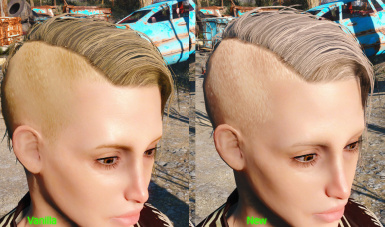 Perfectly okay to use with new hair mesh mods. Only shows up on the player character as far as I know. I haven't tested how it looks with hair retexture mods, but it shouldn't look too terrible.